Tenebrae (“shadows” in Latin) is a unique and beautiful service that emerged in the medieval period of Christian history. It offers us the opportunity to experience the betrayal, suffering, and sadness of the death of Jesus (the snuffing out of the Light of the World). The service is intentionally somber, yet beautiful, in nature and includes music, readings, and a homily. 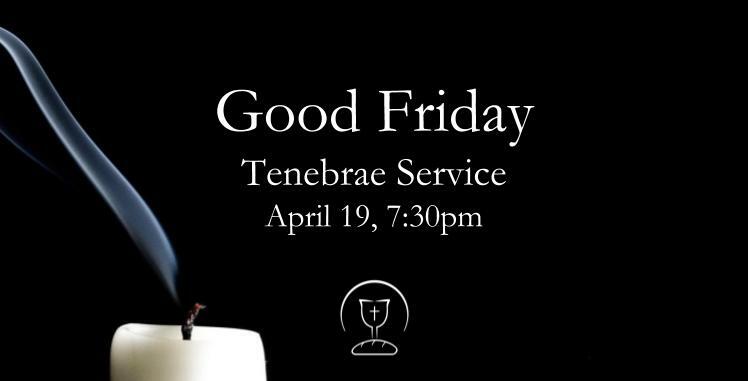 The most distinctive element of the Tenebrae service is that it is structured around the progressive extinguishing of seven candles (leaving us in near total darkness). Childcare will be available for small children. The service is designed to last approximately one hour. Parking: Street parking and the left side of the parking lot at 1504 Bryant St. Typically parking is not too hard to find at this time of day. Attire: Whatever you find comfortable and appropriate. Christians have traditionally worn black on Good Friday. Christians have traditionally chosen to fast from food on Good Friday in order to more fully identify with the sufferings of Christ. We encourage you to take the day off of work (if possible) and to spend at least a portion of the day in contemplation of the act that defines love. We’re not afraid to enter into the sorrow of Good Friday because Easter Sunday is on the way!